Men are my preference. Follow my journey. 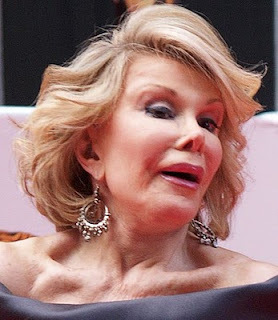 : Joan Rivers Remark: Racy or Racist? Joan Rivers made an ignorant remark aimed at US 1st lady Michelle Obama on a recent radio stop to promote her reality show. So was the the remark racy or racist? Listen to the clip for yourself after the jump. For me that was way out of line. Blacky-O? Of all the things! Here's hoping that her actions have some negative effect because I for one am tired of these A-list folk getting cut slack when they overstep the mark.